Clarice is a white Chinese goose. She and her partner were left in a neighborhood pond after their owners moved out. Neighbors looked after them but Clarice's mate was killed shortly afterward. Clarice lived alone on the pond for eight years. She called after the Canada geese that flew in and out of the pond but she was left alone everyday. We were called to check on her because she was attacked by a predator. She needed an emergency wing amputation because her wing was in a state of gangrene. One day, I noticed that Clarice was pushed up against the wall of her pen straining to be close to the goslings in the next pen. They were also drawn to her and were sitting as close as they could get to her. We decided to go ahead and see what would happen if we allowed them to mingle. 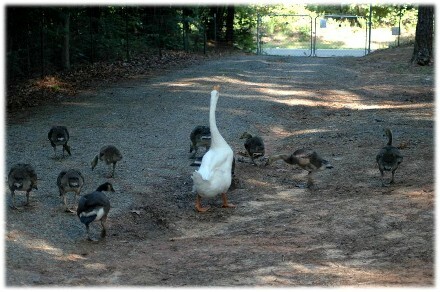 Clarice has now taken over guardianship of each and every gosling that comes into the rescue. She attacked a mallard who came too close to her babies so we moved her and all the goslings into their own pen. She also gets mad at me when I pick them up for exams! 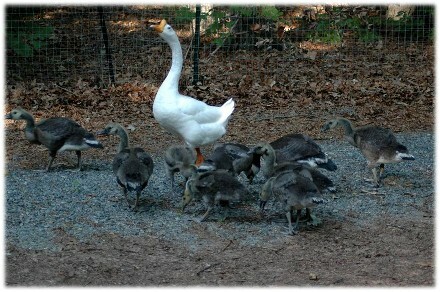 Clarice now has a much larger brood of goslings but no matter now many, she accepts them all as her own. We allow her to roam the fenced rescue land during the day when someone is there and she is now preparing goslings for flight. It is such a joy to see them outside running and flapping their wings behind Clarice. I think she knows she can no longer fly but she is passing this gift onto "her" goslings. These pictures were taken several weeks ago. Clarice is now very happily taking care of about 50 goslings. Recently, Carolina Waterfowl Rescue is caring for and treating oiled birds. They desperately need your donations and help. Please visit CAROLINA WATERFOWL RESCUE FOR MORE INFORMATION.